The new day has seen a victor giving a speech, a very humanitarian one at that. A gracious victor is a rare as a gracious looser and yet we have seen both on the same ticket. The system has chewed up many a good man in its need to preserve its own institutions, lets hope that this time it has learned from its own shortcomings from its recent past. The previous reading did speculate about being careful for what you wish for, this world is known for not satisfying, delivering or producing the goods and the means at the same hour as the man of the moment arrives. The best intentions are corralled and claim jumped by the opportunists and the ‘powers that be’ that seek only to preserve their own strong holds. It is a bad thing when a home-grown democracy that professes to be humanist as opposed to god driven or anarchistic. Invades another country to enforce its rule abroad using dictatorial methods to force changes on people who hold the sovereignty of their own land. The democrat abroad is showing a dictatorial attitude must surely mean some suppression, don’t we all let our hair down, take a break from routine and rules abroad, isn’t that what the saying, ‘whatever happens in LA stays in LA’ is all about. Legal medical marijuana in the USA is the backdrop for eliminating the drug production in other countries, and as Afghanistan is still the highest exporter to the world stage it goes without saying that it is better to eliminate the opposition before you establish a monopoly on a product than to share a volatile market place with any competitor. The rest of it reads more like a conspiracy theorists delight than anything else and the speculation about the CIA drug funding for black ops from as far back as the Vietnam war is still top of the schemes proposed, while there is still no smoke without fire is a good maxim to keep in mind when reading them. The Rune Reading for the election is here. 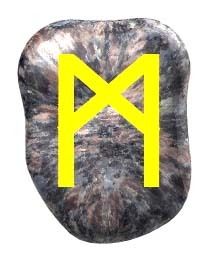 This entry contains a rune reading for the day, Monday 5th of Nov 2012, another for the week commencing today. This is a first introduction to the Talisman Suite VI. 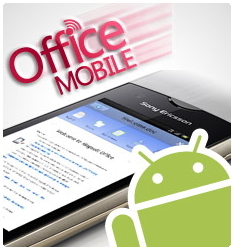 This development was completed in Dec 2011 and has been developed for my own uses, I have never taken this product to the market, and this is the first showing of it. The original development began in 1999, it has been a regular tool for my own use and, I find that I am not able to release it even though I have a website a distribution process and all of the facilities to sell this version while the one with the Horoscopes is finished. I cannot get a job and have been forced of the state handout and when my money runs out I will have to fend like anyone else and I still can’t sell this software, so I will use it as a daily reading platform for the Runes, Tarot, I Ching and Biorhythms. The format is simple, I will draw a reading for the day then review the daily papers and any and all coincidences will be parried as they become evident. And in the great tradition of Blue Peter……… here is one I prepared earlier. This will become a regular feature now that I am getting the the hang of the software and the tech. The last feature is after the reading was done to see if there was any connections from the reading coming through. There is no script with any of these they are recorded in on section or take and they are all adlibed as I go, the piece looks at the events from Tuesday 30th of Oct up until the present. This new kind of blog is as minimal as it takes to get the stuff out to keep with the video clip generation and sound bite size to allow for grazers and other nibblers to graze. This segment contains the minimal research for the article taken after the rune readings above. it in no way cast blame, it just pokes a little light hearted fun at some glaring pillars of the community. Mayor your troubles be little ones. It does go to show that the national Guard was not needed as people like those in Hatti will find the resolve will pull together and as long as marauding gangs are not prowling then order will become established. 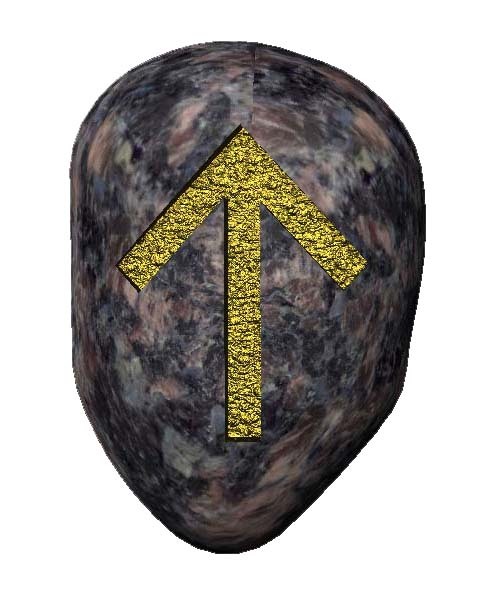 Teiwaz: The rune for the ‘Warrior’, the main skills for a warrior are the survival skills that enable man to endure the harshest terrains and conditions with the ability to fare well and remain fit, active and focused with good spirits intact. The disciplined mind of a warrior that has come through trials and tribulations that the common man would never even contemplate undertaking, that enables him to keep the body fit, alert and active. The skills that a warrior needs to provide for long journeys have usually been instilled since childhood. 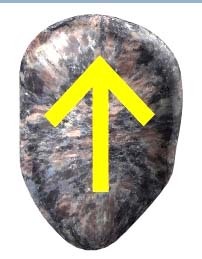 The current trends when under the influence of the Spiritual Warrior rune, usually dictate a need for faith to be brought to the fore, the need for a steel will that is held in readiness, a fortitude that is born of long campaigns and tough trials. When faced with the hard reality of the toughest of circumstances that are being made harder by inclement weather is enough to shake the hopefuls resolve when coupled with hard tack and marching rations the resolution will be tested. A seasoned campaigner with an eye on the long term will have saved their rations of hope until the long dark night just when it will be needed the most. Old enmities will have a new chance to be resolved as well as the chance that new information will help to make old issues better understood allowing for a new type of progress without resentments. The night watch must remain awake till the first light to keep the feelings of ease intact throughout the encampment. The rallying call of the new dawn’s chorus will rouse the weary watcher as the first warm rays of the sun start the daily process of bringing the sleeping to full wakefulness. Arise and meet the day in unconscious rituals until the moment in the day when you awaken to yourself and your life, then deliver the ways and means to take your life on its allotted course of action. Faith Hope and Steel Highlander. 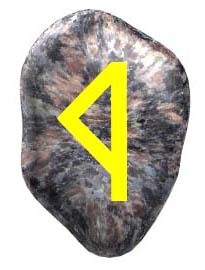 The drawing of a single rune is a solitary reflection on a subject, the whole idea of a layout is to try to place the drawn rune in a localised context for the reading to reflect the meaning in a way that will aid the inquirer. The Rune for this week is the Self, drawn at a time when the sun is in a hyper active state, politicians are looking more and more impotent in the face of the world dissatisfaction at the cost of living escalation’s that are undermining any form of global economic stability from ever getting out of the black hole that all of the nations greed has dug in the world trade markets. The free fall isn’t likely to end in a light touchdown when the final reckoning lands with an almighty bump. The Self is a character that is a made up from the rune character Joy and a reflection of a mirror image of Joy, the whole premise of some observations of the self is that we are all one half of a pairing. Joy is by its makeup a purely positive emotion that has no negative aspects, but it has an opposite state in misery or depression. Some people may see the correlation between the male and female principles. A couple will mirror each other and reflect their state to one another in exchanges. The main viewpoint for the observation of the drawing of the Self for this week is all things that relate to being, wholeness and well being in particular. This is not to suggest that ill health is an issue at this time it is more likely to be bringing to the fore, a process of self re-orientation or an indication of new inner alignments. The general trend around this drawing is the Self is highlighting the process of streamlining finances, goals and directions in the flow as things around us all in the greater world affairs are showing similar changes in action commitments and associations. The good manners of a civilised society is seen best in the display of manners and social exchanges. The protocols of business have established a reasonable etiquette for the transition to a more inclusive view that takes into account the other people in the exchanges, like needs and comforts or rights. The PC dictate’s that have been left after so many public ridicule reactions to some of the more wacky state protocols will through the process of elimination or just through the natural life cycle of redundancy checking to leave us with a socially aware set of recommendations for the present decade. The idea that the self is and does not need any form of adjustment mechanism is a little naive and will only add to the ego’s tendency towards sloth and find an inner ally in the resistance to change that is the stumbling block for most historic civilisations. The past is littered in literary epic’s of the demise of civilisations and empires that we are not stuck for a prime example or two to choose from. That aside the present diminishing world with its almost instant globalisation of rumours, news and theories in the virtual stratosphere is growing from strength to strength. At this time this new alignment of personal space, needs, goals and past achievements is opening up a new Pandora’s box of woes for the corporate world and the governmental limitations of boundaries and borders and their need to control flow, movement and exchanges. The new personal freedoms are though still being infringed on by some of the players in the virtual meeting places of the new sky domain. Facebook and its use of personal information for apps is to access is worry enough but when you consider the use of facial recognition software to identify ‘friends’ that are in the stored pic’s on your private page without your permission to rake through your personal images, while the virtual friends who we have probably never met and don’t actually know will be naturally excluded from this process as they can’t turn up in a photo with you or any of your real friends. The environment shrinks and the natives all redress themselves by proximity and established connections is a natural process. The tribe of man is getting his bearings for the New Age transition from the redundant ways of the old world as more and more people take a more active interest in making the world of their choosing instead of merely accepting the one foisted on us by the imperial state of expedient and convenience. The old whatever would suit them and we would wear it days are nearly over and the inflexibility of old restrictions are being stretched to their furthest extents since the hippy push to make a better world for our children, without the dominating regimes of the dinosaur concrete boys of old, rubbing their hands at the thought of the profits to be had from a docile and obedient consumer. The process of re-assessing our own self in our own domain is a healthy realignment from the process for growth. If you know who you are and where you find yourself is understandable and assuming that you have a good take on the present circumstances in which you find yourself, then your orientation needs only to take a closer look at your goals and expectations to determine the best path to choose to take you to your expected or desired outcome. So if you know who you are, where you come from and know what is going on and the rules of play are clear then your target or goal is almost inevitable in most cases. This will have the effect of natural letting all forms of redundancy drop from your central consciousness and your thinking practices almost mapping out a course of action with greater clarity and less uncertainty than this world has enjoyed in over four decades and on a global scale that the world has never seen before according to recorded history. The path before us can look like it is straight forward until we reach a junction or a crossroads. 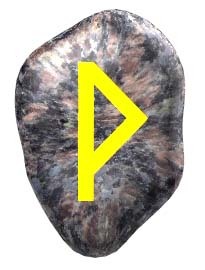 The Runes have a few characters that resemble a junction. 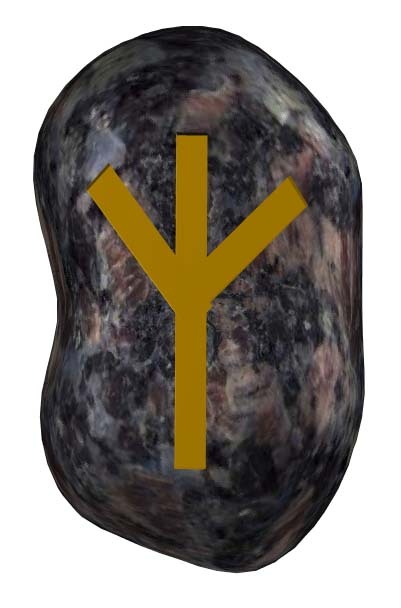 But the one drawn for this auspicious time in the life of man is Algiz, or protection. The main idea for using a layout is to try to represent the trends that can befall a reading. The real trends in life are interpreted from whatever is happening in the environment, the weather or the kinds of external influences that the reader has happening in their life. The Runes are not a true divination tool they are more of a personal almanac and surrogate spiritual guide, there is still no good substitute for the real deal but who in this day and age can afford a genuine spiritual masters time and training. There are of course many types of interpretations for the stones, there are the traditional meanings, then there are the contemporary slant’s including the unpopular twenty-fifth stone. There is also the way of the two paths, the right path and the wrong path. If the spiritual journey is on a spiritual path it has more chance of encountering both paths at certain points than any follower of one or the other ways. We will for the simplicity of communication take the spiritual pathway interpretation so as to not offend the truists that will want to discount the blank stone and for ease we will only talk about any stone that is drawn in this series. The Rune has a perpendicular line that has two alternative paths branching left and right from about four fifths from the top of the central path. Geometrically it is the spiritual path and the branching into either right or wrong but for the spiritual warrior it only has one conclusion, the path less well trod. The way of the right path, the traveller of this path is the righteous son, the obedient participant as the person that meets with their parents approval and is given recognition of it in his lifeline. The path is mostly planned and prepared, educational standards, approved friends and associates, expected discipline, fortitude and a willingness to lift the crown of the family lineage as benignly benefits the righteous. This may seem boring to the more adventurous or even to the non conformist. The left handed path is the way of the prodigal son, the wayward easily bored, chaser after drama, fuss and adulation. The exciting and less rewarding trail for this way strips the being from all of its worldly goods. It is the school of hard knocks that teaches this impetuous child, it is the wheel of fortune that dictates the landmarks and the milestones of this journey. The spiritual path by comparison is a very difficult path, it requires self mastery, it is an active journey to reduce the ego, the school of disciplines are all aimed at mastering the self so that it does not impede the processes of life, so that the warrior can facilitate the flow of life between cruxes to aid life towards its higher purpose. The life purpose is sometimes an act of service and at others a purposeful directing to aid the birthing of the moments expectations. Mankind stands at the threshold of just such an intersection, on the one hand are the right minded individuals that want the growth re-stimulated to continue the way that things were, they way that never delivered, had prices escalating out of all reasonable expectations for the poorer people to meet. The worlds resources are still being squandered at an alarming rate, the system was crooked beyond description from the top to the bottom. They just want what they had and to hell with the consequences. Not quite the right way to proceed for so called right minded people to try to sell the old ideals again in yet another bitter pill for the next generations of indebted slaves to a system that never delivered and never can. The loony left handed path are wailing and gnashing their teeth that the end of the world is neigh (postponed till October by all accounts) and the right minded use this extreme to validate their case and it is easy to see their point. The doom and gloom merchants are quoting ancient texts and ending calendars and it is beginning to sound like an incoherent grumbling rather than any form of new age chant for the new age of enlightened man. Yet Germany turned around and announced that they will discontinue their nuclear reactors by twenty, twenty two, now that’s (20/20) forward thinking vision. It would seem that political correctness was going insane without a real case to attend and now with world concerns, the financial crisis, the central core moving away from the manufacturing money making exercises of the past and are instead hiking the food prices to enforce, a body conscious physique, a new collective heath program, while the pharmaceutical industry is likely to lose a large percentage of its market share to the new age wellbeing initiative. This gives the PC brigade of closet dictators a new twist on getting the mass to follow idealistic lines of universal conformity, through the medium of the new ascetic perfect classic lines physic right out of their one size fits all paradigm for the new age hive mind and body set of being. For the main part the temptation to leave the spiritual path is a delusion that will give the appearance of getting to a more stable starting point for the next transition, but the race collective hindsight of this has never worked out before nor is it likely to because the times are a changing, has to be the mantra for staying the course rather than taking any illusionary short cuts to a finer future. In this world though there are no shortcuts there are no quick fixes and all that glistens is usually just fool’s gold.